Every sock has a match [except for the middle one]. Isn't that usually the case? Side note ~ I found this cute little chalkboard for $2.99 at a little bakery here so I had to pick up a couple. I think I'll have fun playing with them. I had to do a little machine blanket stitching around the toes and heals. Gray ric rac in the binding. I love ric rac in bindings. So sweet. The whole thing is bound in this red and cream ticking stripe [except for one little patch where I was short]. Here's a little sneak peak of the backing. It's flannel. Do you know that I love this little swirl design for the quilting? I use it often. I know this quilt is a little silly but I love the homespun feel of it. Oh, there's the little star that my quilter hid in the quilting! She always quilts in a little surprise for me to find. Kinda fun. Her name is Jen Ostler. She is great and I love the hand guided look. What a perfect quilt for the laundry room! Maybe one could grab one of those socks for all of the mismatched socks in the "for real" laundy. I've been quietly peeking over your shoulder watching your progress on this cute project. I absolutely love it. What a delightful idea for a quilt to hang in the laundry room. That is just adorable! I want one too, so I had better go look for the pattern. Thank you for the link. How cute is that....the quilt and all the decorations. What a cute quilt! It's adorable! Perfect for a laundry room. 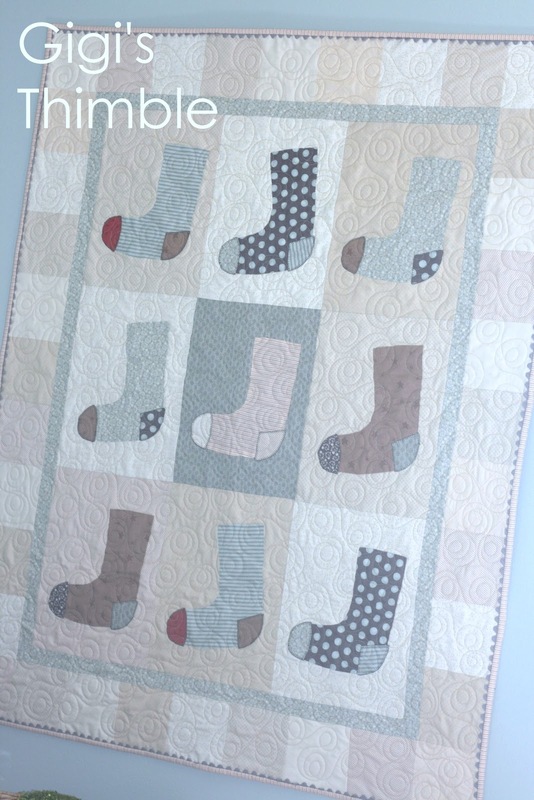 Love the socks quilt such a wonderful idea. great quilt for the laundry room. I love that you made do with your binding! The whole quilt is perfect! Just a little question - when are you going to do some more Farmer's Wives blocks? I love that you are doing them in order of difficulty. What a sweet little quilt! Love your choice of fabrics! That is the cutest thing ever! Love the lonely sock in the middle...how perfect is that?! I found the star! Do I win a prize? I LOVE it! I think the appliqued toes and heels are the best part. I am looking for a good quilter. Can you give me Jen's contact info? Jen's number is 801-772-0166. She is great. I heart her.